Great for snacks, games and coloring, this fun 3-piece Assorted Kids Patio Set features a small round plastic table with a matching folding nylon umbrella and 2 matching folding chairs made of durable nylon with strong metal and plastic framing. Set is weather-resistant for use all year round. Table measures approximately 19" in diameter x 19.25" tall. Umbrella measures approximately 40" in diameter x 48" tall. Chairs measure approximately 15.375" wide x 14.5" deep x 20.75" tall. Chair weight capacity: 65 pounds. Table weight capacity: 40 pounds. 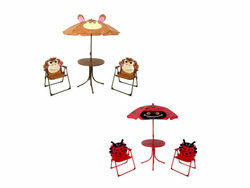 Comes in assorted styles: ladybug and monkey. Comes packaged in an individual box. Box measures approximately 29.5" x 4.5" x 20.25".